One of the primary missions of Flavor Run is to support local charities and connect with great local businesses. And we love it when these two goals are aligned. We are very excited to have on board as sponsors i Rock the Boots for our Phoenix event! i Rock the Boots is a t-shirt company founded by female veterans, for female veterans. They provide quality apparel that embraces the strength, yet femininity of women who selflessly serve. i Rock the Boots donates a portion of their proceeds to organizations that provide assistance to female veterans; women who may be homeless, in transition, or women dealing with trauma. i Rock the Boots has also helped us put together a giveaway – 3 flavorlicious people will win a ticket to the event! Click the link below, and do one of the following; post the link to this blog on your Facebook page, or go to @flavorrun on Instagram find the photo from this blog and repost! Winners will be announced February 23. 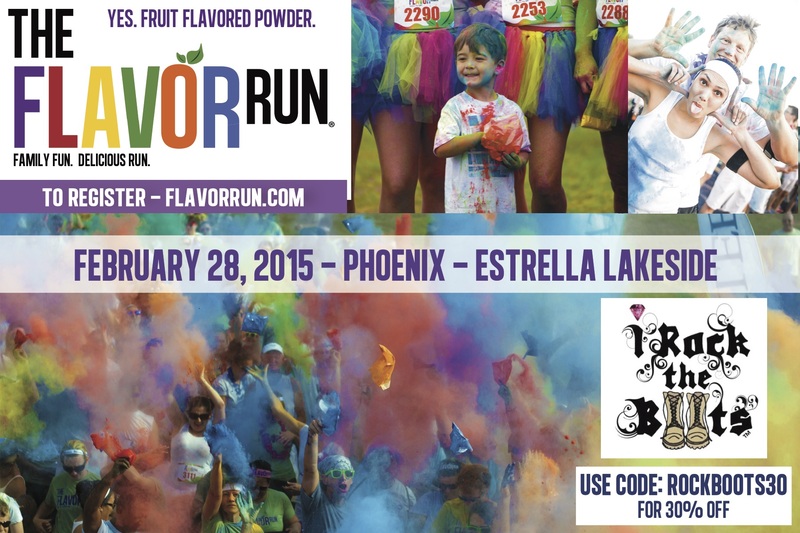 Flavor Run and i Rock the Boots look forward to seeing you all on Saturday, February 28th, at Estrella Lakeside, Goodyear. If you are not one of our lucky winners, you can use the i Rock the Boots discount code below for 30% off! Previous PostNew Flavor Run Contest!Next PostFruits & Fitness! What’s so great about fruit anyway? !